Following their debut edition in 2013, in which thousands flocked to Croatia’s Dalmatian coast from more than 75 countries worldwide, Ultra Europe now gears up for its second annual installment, as it expands to three days and releases its Phase One line up! 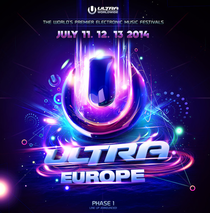 Taking place in the Poljud Stadium, Split from July 11–13, 2014, Ultra Europe will be welcoming both familiar faces and new in 2014, as it bids to become a ‘must do’ festival in the annual calendar. Headlining Ultra Europe 2014 (listed in alphabetical order) will be Afrojack, Armin van Buuren, Carl Cox, David Guetta, Hardwell and Tiësto. In addition, also confirmed is Blasterjaxx, Fedde Le Grand, Laidback Luke, Martin Garrix, Nicky Romero and W&W (also in alphabetical order). With more than 150,000 fans expected to travel from over 100 countries worldwide, Early Bird and Advance General Admission tickets both sold out in a matter of hours after going on sale at the end of last year. Now the final release of GA tickets are available at the price of €129 for ALL three days of the festival.